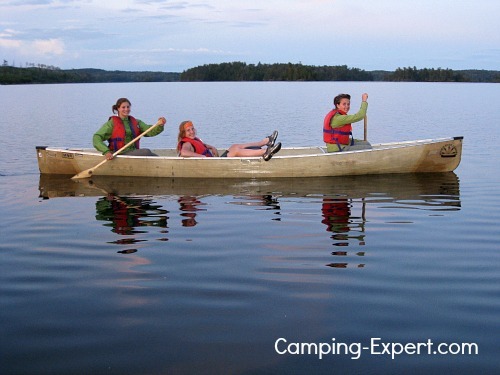 Canoe Camping – Everything you wanted to know about canoes! Everything you wanted to know about Canoes! Canoe camping is how I’ve done most of my camping, and I feel totally at peace and zen-like when I’m out on a lake paddling. Fresh air around me, fresh water below and the sound of my paddle hitting the water. Absolute bliss. If you’ve only ever done drive in camping, or backpacking then you’ll be in for a real treat. For the drive in campers, you’ll finally escape that annoying neighbour camper who listens to the radio when they should be listening to the birds. For those of you that are used to backpacking, then you’ll LOVE the load off your shoulders! What luxury. How to – to really learn to canoe, you should take a course, and have lots of practice, but I’ll give some great tips, and suggest some good courses to take. Canoe parts- sound like an expert the next time that you’re out on the lake – learn what a yoke is, and how to properly pronounce gunwhale! Canoe Safety – I’ll teach some canoe safety tips and techniques that I’ve learned and seen the hard way! From basics to not standing in a canoe, to loading a canoe near rapids. Plus includes a few funny stories so you’ll remember! Trip Planning– Learn about planning your canoe trip park and route ideas for your next canoe trip. Plus share your favourite canoe routes and trips! Canoe camping Checklist – want to know what to bring on a trip? This comprehensive list is the EXACT list that I’ve used for dozens of trips that I’ve lead in Quetico park over 9 years. Canoe outfitters – learn about why an outfitter might be a good option when you’re planning a canoe trip. Portages - I’ll explain good ways to conquer the land, plus give you the opportunity to share YOUR best and worst portage experiences. Canoe Camping gear- Gear that’s specific to canoeing. Plus share what gear you've fogetten and will never forget again! Canoe sailing – I absolutely love a tail wind when canoeing. I am usually sailing in a group of 8 people, so we’ll rig up a sail and enjoy the ride. I’ll share how to safely make your own canoe sailing rig with only a tarp and your paddles, and what you SHOULD NOT do when canoe sailing. Canoe paddles – Choosing the right paddle is extremely important. I’ll explain the different kinds of paddles and how to choose the right size and style for you. Canoe accessories - Learn the important accessories that you should bring with your canoe, plus other non-essential, but good idea canoe accessories. Quetico Park and Boundary waters- one of the best canoe camping locations in all of north America. Hear what I LOVE about the park and why it’s special to me. California canoe and kayak – While on my camping road trip with my brother we came across an amazing place in California to go kayaking, paddle boarding and canoeing. We’ll share it here. Buying a canoe – Tips and information you should know before you purchase your canoe. Learn about the different types of canoes – from Birch Bark canoes to wooden canoes, and newer canoes such as Kevlar canoes. Which ones are good for what type of canoeing. Canoe Manufacturers- which companies make what kinds of canoes. Canoes for sale – find canoes for sale, and great ideas on where to find them for sale. Ideas you NEVER thought of! Plus great deals on Used canoes. Canoe trailer – now that you have a canoe, you need a way to transport your canoe, or even canoes. Canoe rack – Suggestions on easy to assemble canoe racks that you can attach to your car or truck. Canoe cart – should you get a canoe cart for portages and moving your canoe around? Hear my opinion on this gear. Canoe building – Always dreamed of building your own canoe? Well, I’ve never done it, but I know people that do. I’ll share some great places to get started on your canoe! Canoe plans – if you’re building a canoe, you’ll probably need plans to build the canoe. Find some great plans so you can begin as soon as you are ready! Repair – maybe your canoe is in disrepair? It may need some minor, or even major repairs. I’ll share some simple triks, and for the major stuff… I’ll share some great repair ideas too! Canoe racing – There are many kinds of canoe races. Learn what t’s like to participate in a race and what makes canoe racing fun and adrenaline pumping! Canoe kayak magazine – what you can learn from the canoe kayak magazine. Plus, if after reading all of these articles you still want to read more, I’ll share some fantastic books that I LOVE to read about canoe camping. Plus, beyond these 'canoe camping specific' pages, there are lots of resources on this site, from recipes, to choosing the best gear!